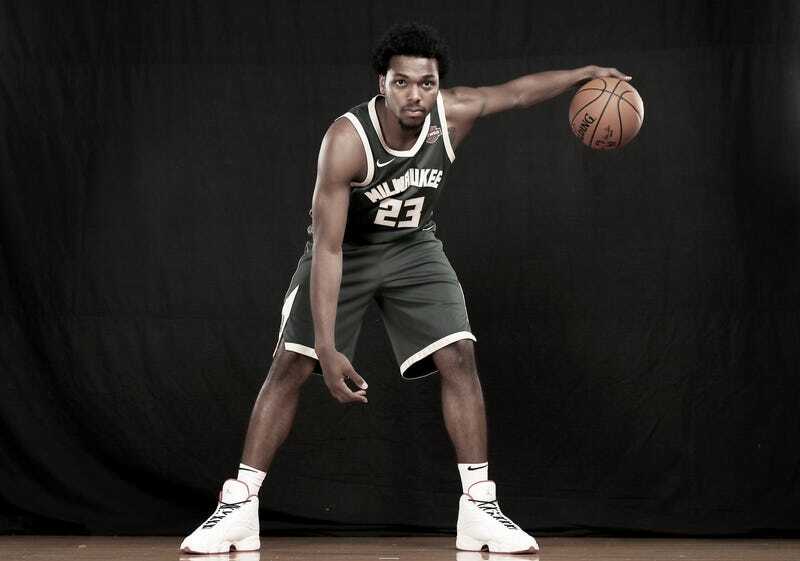 Sterling Brown of the Milwaukee Bucks poses for a portrait during the 2017 NBA Rookie Photo Shoot at MSG Training Center on Aug. 11, 2017, in Greenburgh, N.Y.
New video of the violent arrest of Milwaukee Bucks guard Sterling Brown appears to show one officer stepping on Brown’s ankle while he had already been tased and handcuffed while the officers discussed the backlash around taking down a black NBA player. The new bodycam and squad-car videos obtained by WISN-TV and posted online Sunday show what happened after the violent January arrest, in which Brown was tackled, tased, handcuffed and subsequently arrested after his car was parked in a handicapped space. The initial video, released May 23, shows Brown and an officer discussing the parking violation when several officers pull up and surround Brown. One officer can be seen and heard yelling at Brown to take his hands out of his pockets before all of the officers swarm and tackle the NBA guard to the ground, where he’s tased and handcuffed. Video released Sunday shows an officer stepping on Brown’s ankle and at one point pressing down. “C’mon man, you’re stepping on my ankle for what?” Brown says to the officer, the Associated Press reports. The officer claims that he’s stepping on Brown’s ankle to prevent him from kicking anyone. Brown was not charged with assault against an officer in the melee, which can only mean that at no time did Brown try to attack them, but the officer still felt compelled to step on a handcuffed Brown’s ankle. Other videos obtained by WISN-TV and viewed by AP show an officer talking with two others who are seated in a squad car. The officers discuss how the arrest of Brown could have them perceived as being racist, with one officer saying that if anything goes wrong, it “is going to be, ‘Ooh, the Milwaukee Police Department is all racist, blah, blah, blah,’” AP reports. Another video shows an officer in his squad car calling to let a supervisor know he’ll need to be on overtime before singing, “Money, money, money, money, money … ,” AP reports. Brown’s violent arrest happened a month before Milwaukee Police Chief Alfonso Morales was appointed. Morales apologized to Brown on the day the bodycam footage was released. Morales also claimed to be more transparent with cases of officer misconduct. AP notes that it’s unclear why the new videos were not released along with the first bodycam footage.